“Dark Shadows” (available now): A vampire released from imprisonment returns to visit his dysfunctional descendants in this Tim Burton horror-comedy that stars Johnny Depp, Michelle Pfeiffer and Helena Bonham Carter. “Rock of Ages” (premieres tomorrow): An all-star cast led by Tom Cruise brings this Broadway hit to the big screen. “Prometheus” (premieres Oct. 9): Director Ridley Scott creates a groundbreaking mythology in which explorers discover a clue to the origins of mankind. “Chernobyl Diaries” (premieres Oct. 16): A group of tourists discover they are not alone on an “extreme tour” of the abandoned city. “Moonrise Kingdom” (premieres Oct. 16): Bruce Willis, Ed Norton, Bill Murray and Frances McDormand appear in a quirky story of two 12-year-olds who fall in love and run away together. “Abraham Lincoln: Vampire Hunter” (premieres Oct. 23): Based on the popular novel, this fantasy action flick pits the president against creatures of the night. Watch for more early-release titles coming next month. 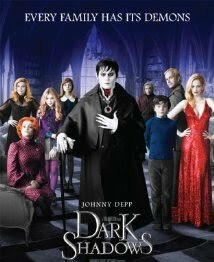 Horror-comedy film “Dark Shadows” is now available through Suddenlink Video on Demand (VOD), eight weeks before Netflix. Johnny Depp stars as Barnabas Collins, a 200-year-old vampire who has been imprisoned in a coffin. Collins is eventually unearthed and makes his way back to his mansion, now inhabited by his dysfunctional descendants. Tim Burton directs; Michelle Pfeiffer and Helena Bonham Carter co-star.